This week has been one of frazzling proportions for the senior volunteers at S2C. Just so much to do and get sorted. It has also been a week of highs and some lows for me personally in relation to moving S2C onward. Be warned, there is the potential for a rant here somewhere but we will see how it goes. Well no actually, lets not, let’s get straight to the ranty bit! One of the things that really gets me quite hot under the collar is when people refer to S2C as “an art group”. For a start the “an” implies singular when the S2C community has over ten organisations running fourteen different sessions in the week with various collaborations alongside S2C’s stand alone sessions. 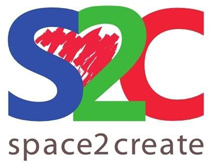 The Space2Create unit is very clearly in our minds a Creative Community that is inclusive of all those who use it, visit it, engage with it or benefit from its presence regardless of their age, ethnicity, sexuality, disability, illness, condition or situation. This has been triggered by two things……first was one of those events that contributed to the busy week, a funding fair up at the Rugby Club. It was great to talk to a number of funders who were able to help and advise us and were absolutely brilliant in suggesting approached and ideas. One of those funders present completely wound me up however. This is where the “art group” was mentioned where within in moments of sitting down they drew upon a previous casual encounter and very quickly were being very dismissive of “our” funding priorities based it seemed to me an assumption that because we use art we were “just another art group” without actually looking closer at what we do. This fuelled my speech to the visitors at the opening of “Abstract Distractions” where I was somewhat wound up about that. The speech was delayed as myself and the Chair were talking to somebody (more about that later) and I actually found myself so angry about it that unusually I almost let emotion get the better of me. As I was talking I was getting a lump in the throat. The point that got me was when I looked at the artwork work on the wall from “the art group” I could see the person behind the artwork and knew the back story of each piece. To impress on people to look at the “art” with understanding that the person who created it may have been contemplating suicide the night before. May have been fighting with an alcohol addiction, may not have had any meaningful contact with other people for days before attending the group, may have been living in fear of abuse, may have been facing another night of pain, may have been wondering how to afford their next meal, may be fighting extreme anxiety. One last bit to the ranty part. I also had someone say from another organisation “Our clients aren’t well enough to be ready to attend your groups”……. So, what lifted me this week. It was fantastic to be able to go and give a presentation to the Kendal Integrated Care Community where we made very welcome and had the opportunity to show and discuss what we actually do beyond being an art group that those present very much understood and appreciated. Some potentially interesting links and opportunities may well arise from that to benefit our service users and the wider community. It has also been great to get some very positive feed back from the James Cochrane Practice about how much the new artwork up ta the Helme Chase Surgery is being appreciated as well as from patients who have let us know how much they enjoyed seeing it while waiting for their appointments. During the exhibition opening (reason the speeches were late) we were talking to a visitor from the County Council who I found quite refreshing. It was one of those conversations where in the first instance you are a bit unsure and then realise that the person is actually trying to help you. What I liked about it was that there were no ambiguities or platitudes. Somebody who spoke their mind and told it as it was. Brilliant. Wish there were more of it in the World. The end result of the conversation was several opportunities to get help and advice from people who were very well qualified to give it. We thank them for that. The most inspiring thing this week however was a phone call from an individual who told me that prior to attending a session at S2C they had been struggling with suicidal thoughts, involved with the crisis team and Samaritans without being able to break out of their low. The difference had been a morning of throwing paint around in supportive company such that they had been lifted and inspired to feeling more positive and thanking us for that. If we can do that even just once in a week then it has all been worth while. Of mice and GP’s…………or maybe the victim that roared? Sorry for all the old film and book references. Titles are hard to come up with weekly and hey, read a few books and been around so I have plenty of corny titles up my sleeve. This last week has been a very busy one for me and the volunteers at S2C. It has been one of those weeks that has had me reflecting on myself and how I cope with things and how others perceive S2C. One thing I have always found difficult is talking to my GP or any Doctor for that matter. I never quiet say what I want to or fully explain things. I miss bits out and rush through or even don’t mention things at all. I also don’t question, accept whatever is said and run out as quickly as possible more often than not feeling like the issues are unresolved or I angry with myself for not talking about the things I needed to. It’s that classic case of difficulty with authority figures as a result of childhood trauma and abuse. You spend your formative years afraid of a dominant figure, lying and hiding truth, in fear of the consequences of discovery. That is bound to have a profound effect on your ability to relate to people in authority and in future years then be expected to divulge your secrets on demand in a ten minute slot. I think to a degree also many people with health problems, in particular mental health, are inhibited in talking to authority figures due to the stigma of the illness which has a similar effect in wanting to keep things secret and hidden. So this week it has been interesting for me to have opportunity to see another side of GP’s on three different occasions. Firstly was at an event last Sunday where I sat alongside a local GP on a panel being questioned by an audience about the benefits of creativity. What struck me about the GP was the fact that they were just a normal every day person. With a particular skill and training but they had the same self doubts, stresses, worries as anyone else. Like many of us they operate in their own bubble of experience and technical terminology depending on their education and chosen career. Sometimes those bubbles are very hard to break out of. This particular Doctor described the “leap of faith” they had to take to start sending their patients to socially engaging projects rather than just giving a prescribed medical intervention. The second instance was talking to about forty training GP’s in small groups and trying to help them see the benefits of social prescribing alongside the normal medical intervention and how the two can compliment each other to provide a very effective support and recovery model for individuals struggling with many different issues. The danger is that people go into medical school from college and have this clinical evidence based practice that dictates their working. To then expect these young Doctors, with little life experience outside of that medical bubble in their early careers, to just accept and start using a model that includes social prescribing with out that same level of clinical evidence is difficult. It was encouraging to see the trainers at the session, themselves very experienced practitioners, highlighting how there was the need to balance medication with social engagement. Plus meeting all the eager training Doctors also made me realise that they are just normal human being, with very specialised knowledge, but human all the same. I apologise in advance for this weeks rambling affair……….lots of things happening. My diary is looking like one that doesn’t actually belong to me as it has some very unusual and diverse entries in it. Lots of scribbles and crossings out and alterations mainly due to the fact that I have a three-week slot of mayhem. In no particular order a volunteer fair, taking down an exhibition, putting up an exhibition, putting up a different exhibition, a funding fair, talking to training GP’s about the benefits of social prescribing, presenting to the Integrated Care Community, taking part in a local radio discussion panel on community, an exhibition preview night, another exhibition preview night and of course the usual day-to-day S2C stuff. I have probably forgotten an odd thing in there too, I am finding that increasingly, with my own medical ongoing issues and also caring for my wife after her stroke sometimes things I say I will do just vanish from memory. Apologies if I have forgotten anything I said I would do to any reading this, just give me a nudge and try again. I am haunted by the thought that there is some poor person sat in a coffee shop somewhere in Kendal waiting for me to turn up for a meeting. So, you are wondering, what is the 39, 40 all about. Well I mentioned exhibitions. I have been thinking and looking back to 2012. When we started S2C which was five years ago in December gone (so we are well on the way to six now) and started adding up all the shows, exhibitions, displays we have done. And I came to the figures that the next two exhibitions we do will be the 39th and 40th in five years! That is a lot of artwork by service users and local artists that might otherwise not have been seen. We have put art in our gallery, in shops, in the Town Hall, in Doctors Surgeries, in Hospitals, in tents in muddy fields, in the Leisure Centre and more. In many cases we have given people their first experience of exhibiting and introduced people to new artists, raised people awareness of art as a tool for recovery. We work with people at their very worst and lowest points through to the point where they are back fully taking part in the local community and the artwork we show tells those stories. Every Service User artwork that goes on show has more in it than just its creative value. Every piece has the story of an individuals journey from the lowest moment to recovery, a snapshot along the way. This is why we are determined that our sessions are always ongoing rather than in short bursts and why we are ken for people to express and explore art rather than force them to do a particular style or method. So this week we put a new selection of Service User Artwork in Helme Chase part of the James Cochrane Practise throughout the waiting rooms and building. The week after we have a major exhibition of artwork on an abstract theme from just about every creative group that come to S2C exploring how being abstract distracts from problems and the benefits to recovery. I run S2C but at the same time I am one of its Service Users too because being involved and being able to lead and run creative sessions making artwork with and alongside some amazingly brave people is helping me as well as them. One of our participants this week told me of how they had jumped up at another organisation to put them straight when they talked about S2C. Apparently they had described S2C as giving “art lessons”. “No, no, no….” the participant had cried out. “………they do so much more than that. It’s not a school, it’s a safe community that makes you feel happy”. Can’t argue with that. This, though, had me thinking, again, about how people react to S2C. I have invariably found that if you talk to anyone who attends sessions and ask them what they get out of coming and joining in then you get a uniquely different answer from each individual. Really that is not surprising because one thing I have found in helping individuals who are struggling with long-term illness, mental health, social problems and isolation is that despite professionals giving them a label or a named condition they don’t all respond or act in the same way. Every individual has a unique experience of an illness or a particular set of circumstances. Yes there are common elements, symptoms or reactions but alongside this runs the influence of their life experience and personality which colours that condition differently for each one. This is why, at S2C, we don’t generally do labels. If you need to come to S2C you can come to S2C. So of course (I’m still thinking about it) this different experience that each individual encounters has common themes. You can go round a room after a session and ask each person what they gained from that session and each will give a different answer but if you do that for a week then certain categories start to emerge. And he we are finally getting around to todays blog topic as one of these threads is that of distraction. Many artists will tell you about being in the moment when creating where you are focused on the act of creating and everything else recedes. At S2C when everyone is busy creating it can go from a bustling, chatting laughing environment to utter silence. There can be twelve people creating side by side but each is lost in the act of creativity. It’s not something that can happen in a place where people feel uncomfortable or threatened. In those moment there is an ultimate level of distraction where nobody is concerned about there issues. Now this may not sound like much but hey, ive been there and definitely have the t-shirt. To be able to escape that over arching all-consuming voice of depression (or whatever each individual is facing) is a blessing. It helps you escape the worries for a while and not only that, it enables you to experience and build realisation that you can escape them. Personal experience of course. Though if you talk to people it is a similar story. You can escape the negative thoughts and through experience relearn to have a positive mindset. PS don’t forget that our Trustee is doing the Great North Swim on Saturday 9th June swimming across the open water of Lake Windermere to raise funds for S2C. Julie has been training hard so please sponsor her. You can find forms at S2C or Julie herself and you can sponsor her by making a donation thorough the Donate button on our website and Facebook page.